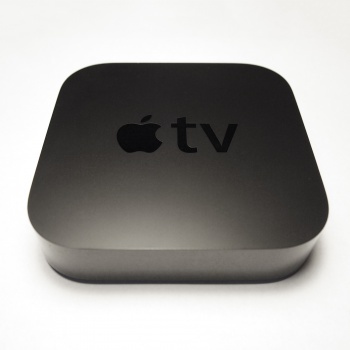 The Apple TV 4 may not just be a streaming device - it could be a gaming console with its own App Store. All things considered, the Apple TV is a pretty slick device. It streams iTunes content directly to your television, supports services like Netflix or Crackle, and connects wirelessly to most Apple devices in your home. The only living room entertainment it doesn't provide is gaming, but some suspect that's about to change. According to anonymous sources, the Apple TV 4 will double as a gaming console, offering games through an online store while supporting Bluetooth game controllers. The information comes from 9to5Mac, who says the latest Apple TV will be the first which supports living room gaming. Its built-in App Store will offer games alongside downloadable video channels, each playable with the updated Apple Remote or a third-party controller. The remote itself will include tactile buttons, a touchscreen interface, and motion sensors. This certainly opens the door for gameplay like aiming directly at a monitor in shooters, or treating the remote like a steering wheel for racing games. These are still technically rumors until they're confirmed by Apple itself, but they wouldn't be surprising if true. The Apple TV 4 is getting a significant hardware upgrade compared to previous models, which seems pretty extensive for Siri integration alone. On top of that, Apple's digital gaming model is already a resounding success on mobile platforms. With more living rooms connecting to the internet every day, it's a great opportunity to slip gaming into the current Apple TV framework. The real questions are (a) what games will launch on the Apple TV, and (b) will it support pre-existing App Store titles? That remains to be seen, but with a surprisingly reasonable max price of $200, the Apple TV just might be able to compete with the likes of Microsoft, Sony, or Nintendo. We'll find out during Apple's San Francisco event on Sept. 9.